The first of the year is typically a good time to review cattle markets and think about the upcoming year. While there will always be debate about which is worse, drought or mud, there was little question about which was the greater issue in 2018. One doesn’t have to drive around rural Kentucky very long to see multiple examples of challenges created by excessive rain. Pasture growth was good well into fall, but muddy conditions brought its own set of challenges. And, winter feeding certainly tends to put those challenges on showcase. 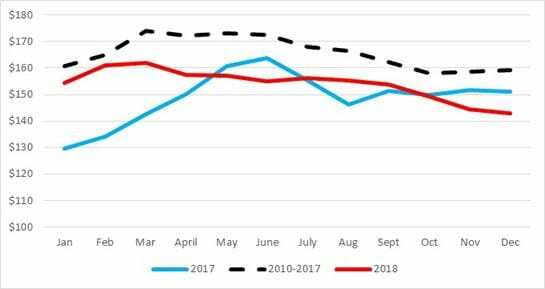 Despite showing a lot of resilience through summer, calf prices fell sharply in the fourth quarter of 2018. The state average price for a 550 lbs steer fell by roughly $12 per cwt from August to December, settling in the low $140’s to end the year. This was approximately $8 per cwt lower than December 2017. Figure 1 tells the story best. 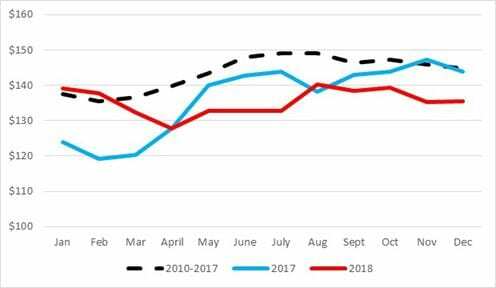 Calf prices in 2018 actually averaged above 2017 levels for the year, but were lower October through December when most calves were sold. I said several times this fall that I was surprised by the strength of heavy feeder cattle markets. Figure 2 depicts state average prices for 850 lb steers, but this chart doesn’t do a very good job telling this story. Largely due to lot size differences, there is always a sizeable difference in state average prices and prices received for loads of steers. For example, when state average prices for 850 lb steers were in the upper $130’s late summer / early fall, groups of 850 lb steers were selling at prices well into the $150’s. Even for December, loads of these steers were still moving in the $140’s. While I hate to say it, I expect 2019 to bring more of the same. I fully expect calf prices to increase significantly by spring due to stocker demand, but the fundamentals don’t point to any signs that would suggest a stronger overall market in 2019. Much is being made about cow slaughter in 2018 and it was up substantially through the first 11 months. But, I think a lot of this was due to dairy cow slaughter. When I try to pull out the dairy cows, I estimate that we slaughtered about 250,000 to 275,000 more beef cows in 2018 than 2017. Given that the USDA estimated the beef cow herd was more than 500,000 head larger in 2018, I don’t think we have culled enough cows to suggest decreasing beef cow inventory. A slightly larger cowherd for 2019 means a slightly larger calf crop to work through markets. And, as we have talked before, production increases are still on the horizon with USDA forecasting 2019 production increases of 3.5%, 5.3%, and 1.4% for beef, pork, and broilers respectively. While surprises are always possible, there is simply no way that I can look at those supply factors and forecast higher cattle prices year-over-year for 2019. Posted by Smith at 5:03am January 15, 2019 Posted in Economics. Bookmark the permalink.